Pro Dive International, one of the Caribbean’s most established PADI 5 Star Dive Resorts and recognized Career Development Centers, today announced that it has been awarded the BENEATH THE SEA – CERTIFICATE OF EXCELLENCE for their SECOND CONSECUTIVE YEAR, in honor of their continued efforts and contribution towards the marine environment. Celebrating their 40th anniversary this year, Beneath the Sea is the largest dive, travel and international oceans exposition in America, hosting more than 400 exhibitors, 70 workshops and seminars, as well as a film festival. The annual 3-day event is held at the Meadowlands Exposition Center in New Jersey, only 10 minutes from New York City. 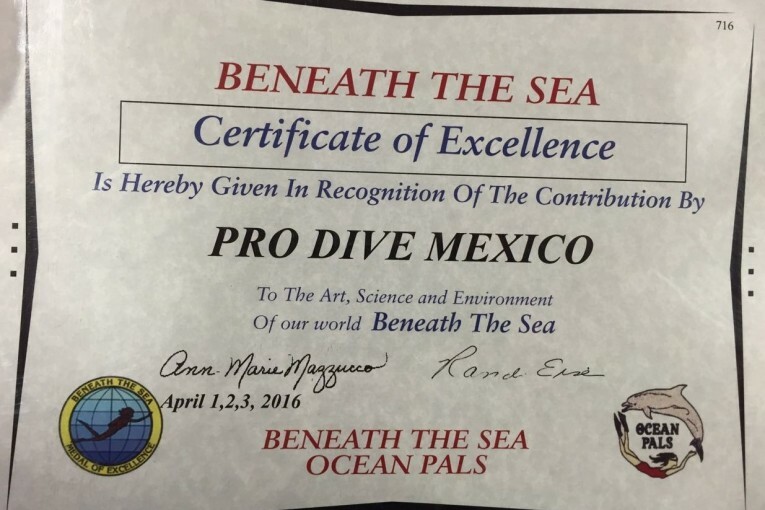 “The protection of our underwater world has been one of Pro Dive International’s major concerns for decades. We put great efforts in particular in shark conservation, in order to protect the top of the food chain that keeps the ocean’s ecosystem healthy and balanced. Not only do we support non-profit organizations internationally, like SHARKANGELS, and SHARKS RESEARCH INSTITUTE, but also actively right in front of our door SAVING OUR SHARKS – a local project focusing on the protection of bull sharks in the Mexican Riviera Maya.” says Markus Fleischmann, CEO and founder of Pro Dive International.